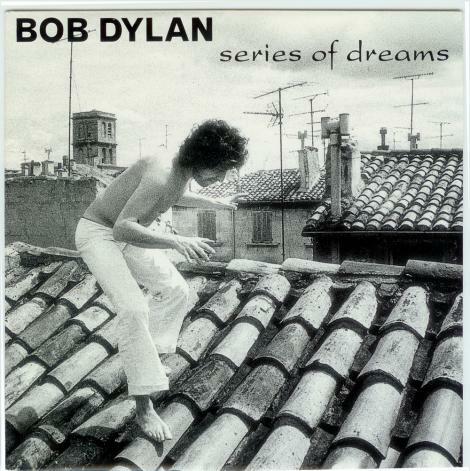 "Series of Dreams" is just that, a series of dreams. This leftover track from the 1989 album "Oh Mercy" was released two years later on the first edition of the Bootleg Series. It's a terrific song, and sounds very much of a piece with the rest of late 1980's pop as it was wending its way into the warmer sounds of the 1990's. It has a kind of glacial majesty that U2 was able to achieve when they didn't ruin it with Bono's homilies to the brotherhood of man and the upper-class alienation of European cities and Wim Wenders films. And it has a good beat. I suspect that opening "Oh Mercy" with it would have not balanced well with the other songs, all of which are more slight in their production. I like this as a standalone. It's too much of a mountain to compete with a bunch of hills. - Nothing comes to the top. - Everything stops, wounded, at the bottom. - Nothing specific. Someone wakes up and screams. - No exit. Time and tempo fly. - Umbrella is folded. Someone throws it in your path. - Your cards are no good unless you're playing interstellar poker. - He witnesses a crime.